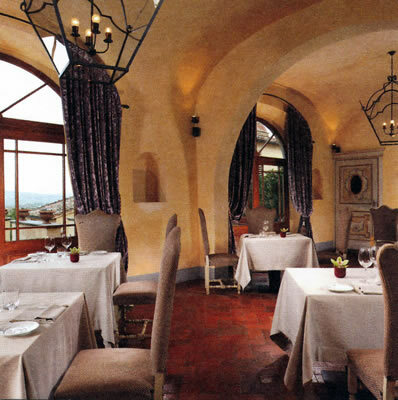 The Castello del Nero is everyone’s dream of Tuscany. A restored 12th Century castle, full of vaulted ceilings and ancient frescoes, it sits upon a gentle hill, between Florence and Siena, surrounded by its own vineyards and olive groves. If any location in Europe can be described as idyllic, this is it. Indeed, when you visit you might care to go to the Castello’s exquisite little chapel – dedicated to St Michael the Archangel – to give thanks for the concentration of so much charm and beauty in one place. 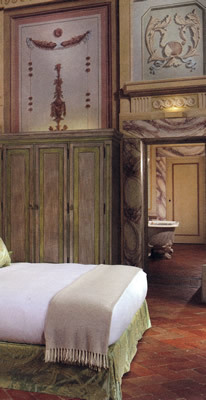 It is good that the Castello is now a luxury hotel; but it is even better that it is now such a very good luxury hotel. I attribute this in no small part to the excellence of the General Manager, Fabio Datteroni. Some hotel managers believe that they have created perfection, and are therefore content simply to preside over their creation. They are, of course, always wrong, and their complacency leads to low and falling standards. Other hotel managers constantly strive for improvement and are keen to hear any suggestions from their guests, and by so doing they ensure their establishments are among the world’s best. Mr Datteroni is of the second group. A small example will illustrate the excellence of his approach. I was sitting on the terrace one afternoon, with a pot of tea and one of the novels of E.F.Benson, when he happened by. I mentioned to him that my bedroom might be improved by the provision of a rug on each side of the bed, for the terra cotta floor – while aesthetically pleasing – was rather cold to my unshod feet. Then I thought nothing more of it. But when I returned to my billet, behold! rugs had been obtained and had been put in place. I was impressed. Indeed, I was impressed by everything about my lodgings. The Castello has 50 rooms, some of them in the ancient castle and some of them in the sympathetically designed modern buildings which are adjacent. My Deluxe Suite (785€ and upwards a night, bed and breakfast for two), number 102, was in the main building, on the ground floor, next to the reception hall. It was an apartment of some grandeur, full of frescoes, vaulted ceilings and painted trompe l’oeil. The decorative theme continued in the bedroom, this time enlivened by the blue and gold of the bed’s spiral corner posts. Within the two wooden wardrobes was enough hanging, even for me. There was, of course, a second television. But the bathroom was the most startling of my rooms. For, quite simply, it was magnificent. 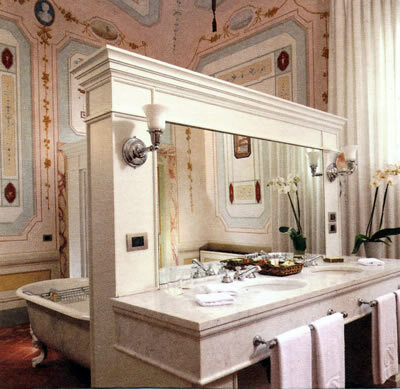 I do not think I have ever before used a bathroom decorated with frescoes from top to bottom. So as not to disturb them, the facilities for my ablutions inhabited an island in the middle of the room. These included a roll-top bath tub, two wash basins and a walk-in ‘double’ shower. The loo was in an alcove to one side, with a bidet. It was not easy to drag myself out of this suite, but the Castello has many reasons for stepping forth – its spa, its restored 12th Century wine cellar and its huge swimming pool among them. But regular readers will know that it is for food that I am most likely to stir from comfortable repose. There are two restaurants. The smaller and more ‘rustic’ is the Taverna, next to the bar, with its walls of exposed brickwork, its vaulted ceiling and its tables of dark wood. Here I ate one of the set meals – the ‘Tuscan’ (65€). Executive Chef Giovanni Luca di Pirro sends from his kitchen dishes which are attractive to the eye and satisfying to the palate. His ingredients are of high quality and his culinary technique is impressive. I tucked in with gusto to the first course, a selection of Tuscan cured meats, with mixed crostini and sheep’s milk cheese. The pasta course reminded me very strongly of Auntie Maud’s Christmas turkey (which is a compliment). I suppose it was the wild boar ragout with crispy bacon which did it. The accompanying pasta was pici, rather like thick spaghetti. Grilled steak – delicious and succulent – came with asparagus, and the dinner ended with a really superb strawberry soup, set off perfectly with coconut foam. The larger and more formal restaurant is La Torre. With its beige napery, silver candlesticks, silver domes, good glassware, modern paintings and waiters in waistcoats, this is a welcoming and sophisticated setting for some very good dining. But before I describe my dinner here, I must include a word of praise for the Maitre d’ Tiziano Siggillino. On one evening a fellow diner – a lady from the United States – had clearly imbibed too heavily before she came in for dinner, and was in danger of making a noisy spectacle of herself. Mr Siggillino dealt with her with the utmost professionalism and within a few moments his kindly discretion had restored total calm to the dining room. Well done, that man. The wine list has 429 offerings, including 29 magnums, and is mostly Italian. Prices run from 25€ for a sweet Piedmontese moscato to 1,500€ for the 2006 vintage of Chateau Margaux. These bottles caught my eye: 2007 Solaia (500€), 2009 Ornellaia (330€), 2010 Masseto (1,000€), 2004 Luce (205€), 2011 Tignanello (150€) and 2011 Cervaro della Sala (95€). The knowledgeable sommelier, Fabio Bellini, had me try both the reds produced by the Castello itself. The grander of the two, poured from its heavy tapered bottle, was remarkably good – full of dense, ripe back fruit with well-integrated tannins and complex undertones. But then, the people of Chianti have had many centuries of experience in wine-making, so such high quality should not surprise us. 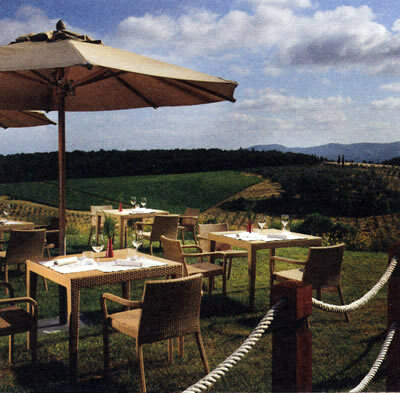 Breakfast on the restaurant terrace each morning, with the rolling countryside spread out before me, was a delight. From the buffet I secured comestibles of the best kind: slices of fruit tart, bowls of pineapple and melon, helpings of Allbran with strawberries and plates of bacon and scrambled eggs. And to me were brought porcelain pots of coffee, buckets of ice cubes and tomato omelettes cooked by the young lady at the ‘omelette station’. Each of these dishes was delicious. My days started well. I was sorry to leave this place. It has an ethereal quality which is truly life-enhancing. It is staffed by those who take pleasure in doing well, and it occupies a location which lifts the spirits. Comfort and serenity are on offer here. 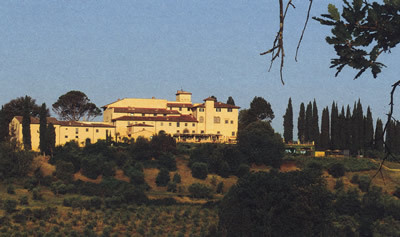 Truly, the Castello del Nero is everyone’s dream of Tuscany. Strada Spicciano 7, 50028 Tavarnelle Val di Pesa, Italy.